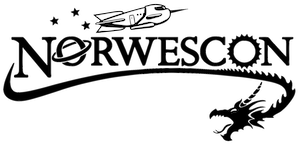 These are the historical archives of Norwescon, the Pacific Northwest's premier science-fiction and fantasy convention. Feel free to browse through our forty years of history! Our many thanks to those who have saved, digitized, and contributed items for this collection. 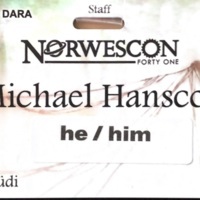 To contribute to these archives, please email us at webmonkeys@norwescon.org. 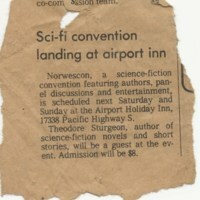 A short newspaper blurb announcing the first Norwescon. 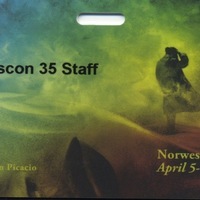 Badge for Norwescon 41. Shown with and without badge ribbons. 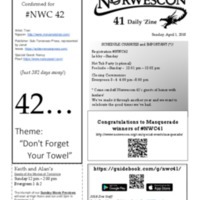 The Sunday issue of the Norwescon 41 daily 'zine.